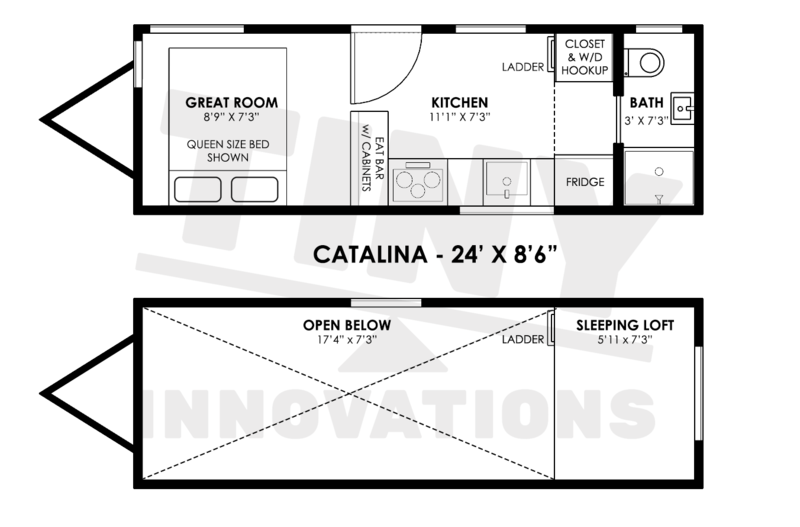 Design your own Tiny House, if you want something we don’t offer just put it in the comments. Add Water Tank with Monitoring System? Creates an additional bedroom. Includes a pocket door. Replace Pocket Door in Dividing Wall with Barn Door? Add Washer - Dryer Combo Unit (gas or electric)? Add Queen Sized Murphy Bed with Built-In Couch? Make it an All Electric Unit? Includes an empty conduit to the roof and electrical accommodation for future install of solar equipment. Add a free solar consultation? Each solar system needs to be custom-tailored for your application. Price may vary, but a range between $12,000 and $20,000 is normal. This estimate is non-binding. By submitting it, you give Tiny Innovations permission to contact you. 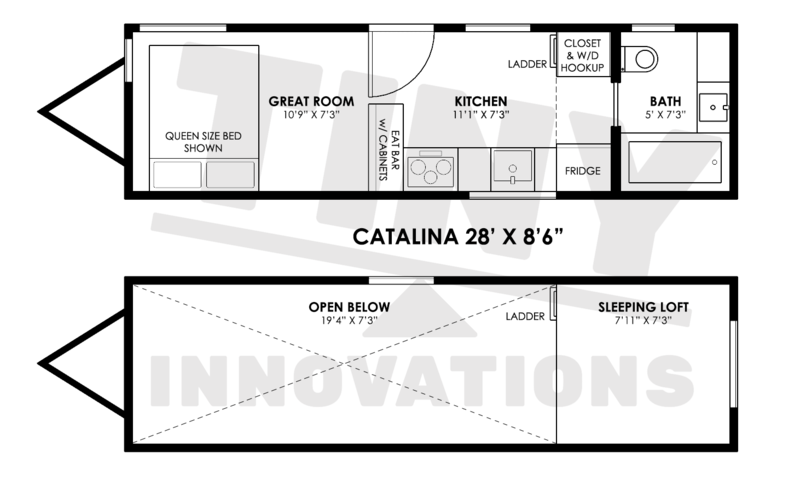 Our exclusive flagship tiny home model, the Catalina, is a piece of modern architectural art. It’s both beautiful and functional in every aspect, from the butcher-block countertops to options like a tile backsplashes and custom-designed stairs with built in storage. We use only the finest materials, appliances and hardware on this model, and pay attention to every detail of design, aesthetics and functionality. Countertops – one slab 1 in. thick butcher block up to 8 feet long. Appliances – high end energy efficient stainless steel – 1 refrigerator (apartment size), 1 propane cook top range and stove combo, stove hood vent and washer/dryer hook-ups. Dual flush round bowl toilet.